In the late 60s, the whole Western world was undergoing a cultural shift. The USA was bombing Vietnam as young people smoking weed were demanding peace and love, and in the UK, busybodies were being haunted by pirate radios propagating rock n roll and miniskirts. When you look at Brazil, however, the situation was even more radical. Swiftly entering the thralls of a far-right dictatorship, Brazil’s pop culture scenario was going through a major upheaval. For many at the time, Brazil’s political situation caused them to run away to London or American cities in order to not “disappear” or be tortured. Although as the 60s folded into the 70s, this climate of fear and repression made way for one of the most playful and culturally subversive movements in modern Latin America – the Tropicália movement. Acting as a quick burst of colourful counterculture, a revolutionary group of artists reclaimed native Brazilian culture in all its multitudes, simultaneously sticking a middle finger up to the Americanisms and “nice boy” tropes popularised during the 60s. To celebrate a movement that was as important at it was fun, here’s a break down of everything you need to know about it. Although Brazil is often portrayed as an amalgamation of parakeets, beaches and carnivals, it is a continent-sized country with a population consisting of generations of European and Asian immigrants, indigenous cultures and a variety of Afro-descendent religions with customs kept alive even after years of slavery. With that in mind, there is no such thing as a “real Brazilian” or a “fake Brazilian” – Brazilians are everyone and they come from everywhere. Drawing from the 1928 literary concept of the “Movimento Antropofágico”, AKA cultural cannibalism, coined by Brazilian modernist and author Oswald de Andrade, Tropicália wanted to grab this multiculturalism by the horns and make it into a new form of culture – taking from not only what was considered “pure Brazilian”, but from African rhythms, American and English pop, repentismo (a quick-paced, rhyme-like form of song from the North East of Brazil) and carnaval. Caetano Veloso’s song “Tropicália” epitomises the movement, celebrating all of Bossa Nova, the indigenous literary character Iracema, the American-loved song “Garota de Ipanema”, Brigitte Bardot, the Brazilian rock singer Raul Seixas, the Brazilian countryside and Carmen Miranda. The visual references of Tropicália were as eclectic as their musical influences. 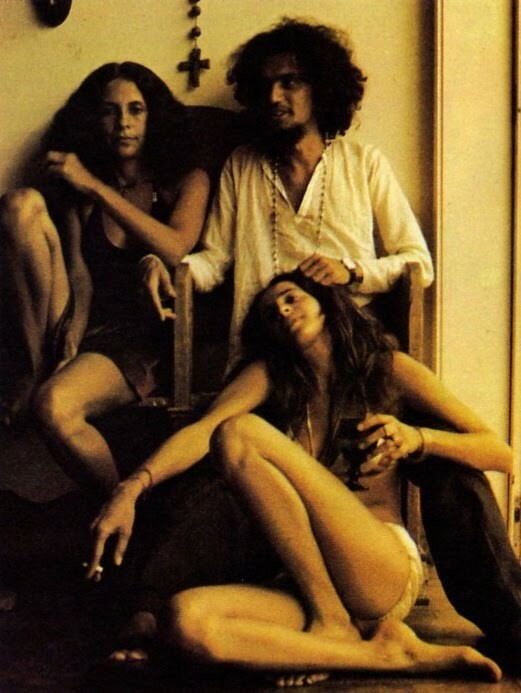 While pop darling Roberto Carlos wore high-necked shirts and neat suits, Tropicália poster-boy Caetano Veloso rocked long curly locks, a myriad of necklaces, dresses and makeup, his flamboyancy acting as a beautiful antidote to the militaristic values of masculine behaviour and so-called morality. 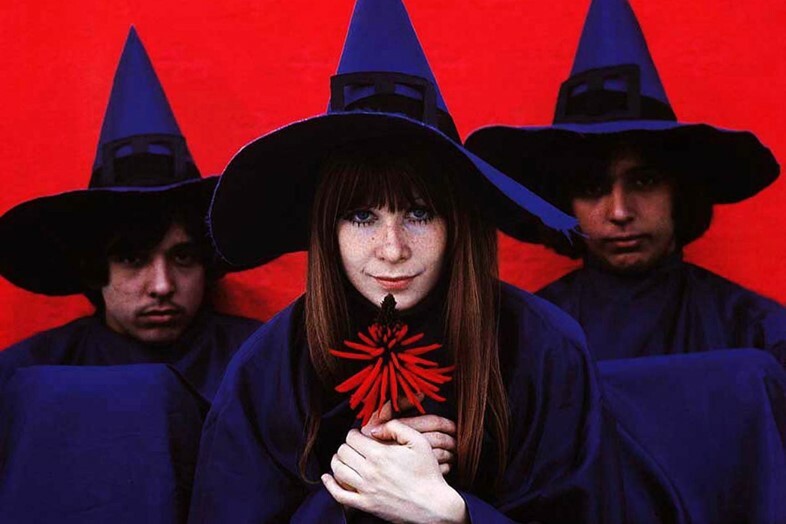 Similarly, a young Rita Lee from rock group Os Mutantes wore a wedding dress, Twiggy lashes and floor-length hair inspired by the American flower power movement, while her bandmate Arnaldo Baptista sported a Romeo and Juliet-style outfit and a traditional countryside Brazilian North-Eastern leather hat over his Beatles-bob. Tropicália artists hailed 30s fruit-wearing icon Carmen Miranda as an influence for being such an overly-exaggerated image of Brazil widely consumed by America, as well as Andy Warhol’s Pop Art movement. Everything was large, exaggerated, and from eclectic – the idea was to reclaim everything that Brazil meant, overlap it and make something as new and as contradictory as Brazil itself, allowing space both for experimental artistic expression and political engagement. Up until 1967, Brazil was known internationally for the ‘Bossa Nova’ genre – tame and bucolic, marketing the country as a tropical paradise, a trope that is still reproduced to this day. However, as the military took control of politics, a large section of Brazil’s left-wing musicians didn’t consider Bossa to be representative of the country any longer. As such, a new movement started to portray the Brazilian experience with the rhythm of Samba and struggle-driven narratives, which were then seen as an “authentic” form of Brazilian music. At the same time this was happening, the soon-to-be icons of Tropicália Gilberto Gil and Caetano Veloso first emerged from Bahia, a state in the Northeast of the country. They drew from psychedelia, Maracatu, Samba, African Rhythms such as Capoeira and every sound to ever grace the ears of Brazilians all over – creating a completely new wave of style, which rejected both the elitism of what Brazilian music was “supposed to be” and the conservative roots of Bossa Nova. “We thought we should be sounding Brazilian but sounding global as well”, Gilberto Gil told the BBC in 2007. Playing alongside Os Mutantes, he was the first musician in Brazilian history to be accompanied by a rock band in a televised song contest. Although the widely known work of Os Mutantes, Tom Zé, Gal Costa and Caetano Veloso has spread worldwide since the 70s, the Tropicália movement also included a variety of authors, artists and filmmakers. For instance, the now celebrated artist Hélio Oiticica originally coined the term “Tropicália” to describe a piece of installation art which combined modernist architecture and Brazil’s nature with a favela-like interior – a stand he described as against the whitewashing of Brazilian culture. Of course, by its very nature, the Tropicália movement was defiantly politically charged as it stood in opposition to everything that came before it. One of its often-used mottos was “Seja Marginal, Seja Herói” (“Be a delinquent, be a hero”), a phrase first coined by artist Hélio Oiticica. It was their wish to shake up the status quo and create something completely new that threatened the establishment – as Tom Zé summed-up in the documentary Tropicália: “In a dictatorship, thinking is a crime”. The legacy of the movement is still felt to this day. As the founding artists of Tropicália continue to create in new ways, the path opened by their influence has given way to newcomers such as O Terno and Boogarins, whose sound is notably outlined by Brazil’s (now) unashamed multiculturalism. The influence of Tropicália has also spilled outside of Brazil’s borders, with artists such as David Byrne, Devendra Banhart, Of Montreal, Nelly Furtado and Beck (who released a track called “Tropicália”) citing the movement as having an enduring impact on their life and work.